This article is about the bodyguard of Plautis and Salonia Carvain. For the bodyguards of Pelagius the Suspicious, see Bodyguard (Pelagius). This Bodyguard is an Imperial soldier who can be found guarding Plautis and Salonia Carvain during a random encounter in the wilderness. 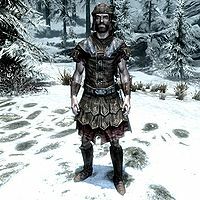 They have traveled from Cyrodiil to Skyrim in order to participate in the wedding between Vittoria Vici and Asgeir Snow-Shod, but never make it there. According to Plautis the second time you meet him, he is ultimately eaten by a dragon. The bodyguard wears either Imperial light armor or studded Imperial armor, along with Imperial light boots and matching bracers, and helmet. He carries a matching shield, Imperial sword, and a torch. This page was last modified on 10 April 2014, at 00:03.